You officially entered this world at 5:04am weighing 8 pounds and 9 ounces. You measured 21.25 inches in length. Although we had to be induced early due to some complications, the idea of you growing for another week and a half scares mommy and daddy (mommy more). She's glad you weren't a 10 pounder! We might be a little biased, but we think you are just the cutest little baby in this world. You have your mommy's nose and chubby little cheeks. You have your daddy's lips and eyes. We thought you would have your daddy's head, but we're not so sure anymore. Only time will tell. You make the cutest little baby noises and all the nurses are in love with you. But, their love for you is nothing compared to mommy and daddy's love for you. The past 48 hours wouldn't all be categorized as "fun" for Mommy. Just as Mommy and Daddy were getting used to the idea of being induced early (Monday night/Tuesday morning) Mommy’s blood pressure went up again, but higher. 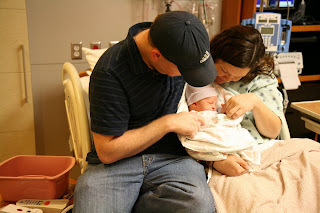 Due to the preeclampsia it was time for little MacGregor to be born. Although it was a LONG 48 hours, 2 days later, meeting little Jackson North MacGregor made it all worth it. Thank you for the new photos! Wishing every minute we could be there. He really is beautiful! Congrats again. I can't wait to meet him! Congratulations!! He is a handsome lil man. Welcome to the world Jackson! !